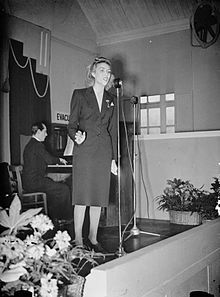 Dame Vera Margaret Lynn CH DBE OStJ (née Welch; born 20 March 1917), widely known as "the Forces' Sweetheart", is an English singer of traditional pop, songwriter and actress, whose musical recordings and performances were enormously popular during the Second World War. During the war she toured Egypt, India, and Burma as part of Entertainments National Service Association (ENSA), giving outdoor concerts for the troops. The songs most associated with her are "We'll Meet Again", "The White Cliffs of Dover", "A Nightingale Sang in Berkeley Square" and "There'll Always Be an England". She remained popular after the war, appearing on radio and television in the UK and the US and recording such hits as "Auf Wiederseh'n Sweetheart" and her UK Number one single "My Son, My Son". Her last single, "I Love This Land", was released to mark the end of the Falklands War. In 2009, at age 92, she became the oldest living artist to top the UK Albums Chart, with compilation album We'll Meet Again: The Very Best of Vera Lynn. She released the compilation album of hits Vera Lynn 100 in 2017, to commemorate her centennial year, and it was a number-3 hit, making her the first centenarian performer to have an album in the charts. She has devoted much time and energy to charity work connected with ex-servicemen, disabled children, and breast cancer. She is held in great affection by veterans of the Second World War to this day and in 2000 was named the Briton who best exemplified the spirit of the 20th century. Vera Margaret Welch was born in East Ham, Newham, on 20 March 1917, to parents Bertram Samuel Welch (1883–1955) and Annie Martin (1889-1975), who had married in 1913. She began performing publicly at the age of seven and adopted her maternal grandmother Margaret Lynn's maiden name as her stage name when she was eleven. Her first radio broadcast, with the Joe Loss Orchestra, was in 1935. At this point she appeared on records released by dance bands including those of Loss and of Charlie Kunz. In 1936 her first solo record was released on the Crown label, "Up the Wooden Hill to Bedfordshire". This label was absorbed by Decca Records in 1938. After a short stint with Loss she stayed with Kunz for a few years during which she recorded several standard musical pieces. In 1937 she moved to the aristocrat of British dance bands, Bert Ambrose. She is best known for her 1939 recording of the popular song "We'll Meet Again", written by Ross Parker and Hughie Charles; the nostalgic lyrics ("We'll meet again, don't know where, don't know when, but I know we'll meet again some sunny day") were very popular during the war and made the song one of its emblematic hits. During the Phoney War, the Daily Express asked British servicemen to name their favourite musical performers: Vera Lynn came out on top and as a result became known as "the Forces' Sweetheart". In 1941, during the darkest days of the Second World War, Lynn began her own radio programme, Sincerely Yours, sending messages to British troops serving abroad. She and her quartet performed songs most requested by the soldiers. Lynn also visited hospitals to interview new mothers and send personal messages to their husbands overseas. Her other great wartime hit was "The White Cliffs of Dover", words by Nat Burton, music by Walter Kent. In 1943 she appeared in the film We'll Meet Again. Contrary to later reports, she neither sang nor recorded "Rose of England" during this time and it was only in 1966 when her producer, David Gooch, selected it for her album More Hits of the Blitz that she became familiar with it. The album itself was a follow-up to Hits of the Blitz produced by Norman Newell. During the war years she joined ENSA and toured Egypt, India and Burma, giving outdoor concerts for the troops. In March 1944 she went to Shamshernagar airfield in Bengal to entertain the troops before the Battle of Kohima. Her host and lifelong friend Captain Bernard Holden recalled "her courage and her contribution to morale". In 1985, she received the Burma Star for entertaining British guerrilla units in Japanese-occupied Burma. Lynn's "Auf Wiederseh'n Sweetheart" in 1952 became the first record by a British performer to top the charts in the United States, remaining there for nine weeks. She also appeared regularly for a time on Tallulah Bankhead's US radio programme The Big Show. "Auf Wiederseh'n Sweetheart", along with "The Homing Waltz" and "Forget-Me-Not", gave Lynn a remarkable three entries on the first UK Singles Chart, a top 12 (which actually contained 15 songs owing to tied positions). Her popularity continued in the 1950s, peaking with "My Son, My Son", a number-one hit in 1954 which she co-wrote with Gordon Melville Rees. In 1960 she left Decca Records (after nearly 25 years) and joined EMI. She recorded for EMI's Columbia, MGM and HMV labels. She also recorded Lionel Bart's song "The Day After Tomorrow" for the 1962 musical Blitz! ; she did not appear onstage in the play, but the characters in the play hear the song on the radio while they shelter from the bombs. In 1967 she recorded "It Hurts To Say Goodbye", a song which hit the top 10 on the Billboard Easy Listening chart. She hosted her own variety series on BBC1 in the late 1960s and early 1970s and was a frequent guest on other variety shows, notably the 1972 Morecambe & Wise Christmas Show. In 1972 she was a key performer in the BBC anniversary programme Fifty Years of Music. In 1976 she hosted the BBC's A Jubilee of Music, celebrating the pop music hits of the period 1952–1976 to commemorate the start of Queen Elizabeth II's Silver Jubilee year. For ITV she presented a 1977 TV special to launch her album Vera Lynn in Nashville, which included pop songs of the 1960s and country songs. The Royal Variety Performance included appearances by Vera Lynn on four occasions: 1960, 1975, 1986 and 1990. Lynn was also interviewed about her role in entertaining the troops in the India-Burma Theatre, for The World at War series in 1974. Lynn is also notable for being the only artist to have a chart span on the British single and album charts reaching from the chart's inception to the 21st century – in 1952 having three singles in the first ever singles chart, compiled by New Musical Express, and most recently having a No. 1 album with We'll Meet Again – The Very Best of Vera Lynn (see below). Locomotive No. 3672 Dame Vera Lynn at North Yorkshire Moors Railway. Lynn was awarded the British War Medal 1939–1945 and the Burma Star. She was appointed Officer of the Order of the British Empire (OBE) in the 1969 New Year Honours "for services to the Royal Air Forces Association and other charities", and was advanced to Dame Commander of the Order of the British Empire (DBE) in the 1975 Birthday Honours for charitable services. In 1976 she received an honorary Doctorate of Laws from the Memorial University of Newfoundland. She received the Freedom of the City of London in 1978. She was made a Commander of the Order of Orange-Nassau in 1985. She was made an Officer of the Order of Saint John (OStJ) in 1998 and, in 2000, Lynn received a special "Spirit of the 20th Century" Award. A street named in her honour, Vera Lynn Close, is situated in Forest Gate, London. She was appointed a Member of the Order of the Companions of Honour (CH) in the 2016 Birthday Honours for services to entertainment and charity. A preserved example of the WD Austerity 2-10-0 class of steam locomotives at the North Yorkshire Moors Railway is named Dame Vera Lynn. The 1964 film Dr. Strangelove directed by Stanley Kubrick, starring Peter Sellers and George C. Scott, ends with a montage of nuclear explosions accompanying Vera Lynn's song "We'll Meet Again". Vera Lynn's visit to the Burma front during World War Two was included in the British television program The World at War, a documentary series broadcast in 1973-74 and narrated by Lord Olivier. She is seen laughing with British soldiers and signing autographs, surrounded by an admiring crowd. A short interview made for the documentary is included in Episode 14, "It's A Lovely Day Tomorrow: Burma 1942-1944". On their 1979 album The Wall, Pink Floyd released a song titled "Vera", referencing Vera Lynn and the song "We'll Meet Again" with the lyrics "Does anybody here remember Vera Lynn? / Remember how she said that / We would meet again / Some sunny day?". "We'll Meet Again" was also used as an intro to the live performances of The Wall in 1980 and '81 (as can be heard on Is There Anybody Out There? The Wall Live 1980–81). The 1982 film Pink Floyd – The Wall opens with "The Little Boy that Santa Claus Forgot" performed by Lynn. In the flash animation internet series Salad Fingers by David Firth, the seventh episode titled "Shore Leave" ends with Salad Fingers singing "We'll Meet Again". The 2017 film Kong: Skull Island featured Vera Lynn's song "We'll Meet Again" as the mission survivors leave Skull Island. One of two new boats for the Woolwich Ferry service, which were delivered via Tilbury in autumn 2018, was named Dame Vera Lynn in her honour. http://www.shipspotting.com/gallery/photo.php?lid=2913660 Photograph of the ferry. On his 2018 album "Would You Still Be In Love", Anthony Green released a song titled "Vera Lynn" that referenced her songs "We'll Meet Again" and "A Nightingale Sang In Berkeley Square". A "Vera Lynn" is Cockney rhyming slang for a "skin" (cigarette paper). On their 2015 album Polish / British duo Smolik / Kev Fox recorder song titled “Vera Lynn” with references to London bombing and Vera Lynn. In 1953 Lynn formed the cerebral palsy charity SOS (The Stars Organisation for Spastics) and became its chairperson. The Vera Lynn Charity Breast Cancer Research Trust was founded in 1976, with Lynn its chairperson and later its president. In 2002 Lynn became president of the cerebral palsy charity The Dame Vera Lynn Trust for Children with Cerebral Palsy, and hosted a celebrity concert on its behalf at Queen Elizabeth Hall in London. In 2008 Lynn became patron of the charitable Forces Literary Organisation Worldwide for ALL. In 2010 Lynn became the patron of the Dover War Memorial Project, and also in 2010 she became patron of the British charity Projects to Support Refugees from Burma/Help 4 Forgotten Allies. In 2013 Lynn joined a PETA campaign against pigeon racing, stating that the sport is "utterly cruel". Lynn sang outside Buckingham Palace in 1995 in a ceremony that marked the golden jubilee of VE Day. This is stated to have been her last known public performance, although she sang again on the evening of the same day in the public concert in Hyde Park. The United Kingdom's VE Day Diamond Jubilee ceremonies in 2005 included a concert in Trafalgar Square, London, in which Lynn made a surprise appearance. She made a speech praising the veterans and calling upon the younger generation always to remember their sacrifice, and joined in with a few bars of "We'll Meet Again". Following that year's Royal British Legion Festival of Remembrance Lynn encouraged the Welsh singer Katherine Jenkins to assume the mantle of "Forces' Sweetheart". In her speech Lynn said: "These boys gave their lives and some came home badly injured, and for some families life would never be the same. We should always remember, we should never forget, and we should teach the children to remember." In September 2008 Lynn helped launch a new social history recording website, "The Times of My Life", at the Cabinet War Rooms in London. Lynn published her autobiography, Some Sunny Day, in 2009. She had written two previous memoirs: Vocal Refrain (1975) and We'll Meet Again (1989). In February 2009 it was reported that Lynn was suing the British National Party (BNP) for using "The White Cliffs of Dover" on an anti-immigration album without her permission. Her lawyer claimed the album seemed to link Lynn, who does not align with any political party, to the party's views by association. In September 2009, at the age of 92, Lynn became the oldest living artist to make it to number 1 in the British album chart. 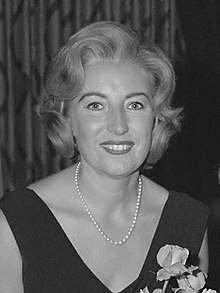 Her compilation album We'll Meet Again: The Very Best of Vera Lynn entered the chart at number 20 on 30 August, and then climbed to number 2 the following week before reaching the top position, outselling both the Arctic Monkeys and the Beatles. With this achievement, she surpassed Bob Dylan as the oldest artist to have a number one album in the UK. In August 2014 Lynn was one of 200 public figures who were signatories to a letter to The Guardian opposing Scottish independence in the run-up to September's referendum on that issue. In May 2015 she was unable to attend VE Day 70: A Party to Remember, in London but was interviewed at home by the Daily Mirror. Three days before her 100th birthday on 17 March 2017, a new LP entitled Vera Lynn 100 was released through Decca Records. The album, setting Lynn's original vocals to new re-orchestrated versions of her songs, also involves several duet partners including Alfie Boe, Alexander Armstrong, Aled Jones and the RAF Squadronaires. Parlophone, which owns Lynn's later recordings from the 1960s and 1970s, released a collection of her songs recorded at Abbey Road Studios entitled Her Greatest from Abbey Road on 10 March 2017, including five previously unreleased original recordings. Lynn received two nominations at the 2018 Classic Brit Awards for Female Artist of the Year and Album of the Year and was also the recipient of the Lifetime Achievement Award. In 1941 Lynn married Harry Lewis, a clarinetist and saxophonist, and fellow member of Ambrose's orchestra whom she had met two years earlier. They had one child, Virginia Penelope Anne Lewis. Her husband died in 1998. After the Second World War Lynn and Lewis moved to Finchley, north London. Lynn has lived in Ditchling, Sussex, since the early 1960s. Vera Lynn made her solo recording debut with the song "The General's Fast Asleep" on 3 October 1935, accompanied by the Rhythm Rascals (a pseudonym for Jay Wilbur's orchestra). The 9" 78 rpm single was issued on the Crown Records label, which went on to release a total of 8 singles recorded by Vera Lynn and Charles Smart on organ. Early recordings include "I'm in the Mood for Love" and "Red Sails in the Sunset". In 1938, the Decca label took over control of the British Crown label and the UK-based Rex label; they had also issued early singles from Lynn in 1937, including "Harbour Lights". In late September 1939 Vera Lynn first recorded a song that continues to be associated with her: "We'll Meet Again" was originally recorded with Arthur Young on the Novachord. Throughout the 1940s and 1950s the Decca label issued all of Lynn's records, including several recorded with Mantovani and His Orchestra in 1942 and with Robert Farnon, from the late 1940s. These were only available as 78 rpm singles, which contained only two songs as an A and a B-side. In the mid-1950s Decca issued several EP singles, which comprised between two and four recordings per side, such as Vera Lynn's Party Sing Song from 1954. Singles were now issued on two formats: the known 78 rpm 10" shellac discs, and the recently introduced 45 rpm 7" vinyl single. In the late 1950s Lynn recorded four albums at Decca, the first; Vera Lynn Concert remains her only live recording ever issued on vinyl. In 1960, after more than 20 years at Decca Records, Lynn signed to the US based MGM Records. In the UK her recordings were distributed by the His Masters Voice label, later EMI Records. Several albums and stand-alone singles were recorded with Geoff Love & His Orchestra. Norman Newell also took over as Lynn's producer in this period and remained with her until her 1976 album Christmas with Vera Lynn. Recording at EMI Records up until 1977, Lynn released thirteen albums with material as diverse as traditional Hymns, pop and country songs, as well as re-recording many of her known songs from the 1940s for the albums Hits of the Blitz (1962), More Hits of the Blitz and Vera Lynn Remembers – The World at War (1974). In the 1980s two albums of contemporary pop songs were recorded at the Pye Records label, both including covers of songs previously recorded by artists such as ABBA and Barry Manilow. In 1982 Lynn released the stand-alone single "I Love This Land", written by André Previn, to mark the end of the Falklands War. Lynn's last recordings before her retirement were issued in 1991 via the News Of The World newspaper, with proceeds in aid of the Gulf Trust. ^ Seidenberg, Steven; Sellar, Maurice; Jones, Lou (1995). You Must Remember This. Great Britain: Boxtree Ltd. p. 132. ISBN 0-7522-1065-3. ^ Simpson, Richard (14 September 2009). "Dame Vera Lynn, the new queen of the album charts at 92". The Daily Mail. Retrieved 9 February 2016. ^ Manheim, James M. "Vera Lynn biography". Index of Musician Biographies. Retrieved 10 January 2011. ^ Lynn, Vera (2009). Some Sunny Day. London, UK: Harper Collins. p. 43. ISBN 978-0-00-731815-5. ^ a b Baade, Christina L. (2012). Victory Through Harmony: The BBC and Popular Music in World War II. Oxford University Press. p. 8. ^ a b c "Vera Lynn Biography". Musicianguide.com. Retrieved 23 October 2009. ^ "We'll Meet Again (1943)". IMDb.com. Retrieved 4 January 2011. ^ Pertwee, Bill (1992). Stars in Battledress. London, UK: Hodder and Stoughton. p. 19. ISBN 0-340-54662-X. ^ "Technology Obituaries: Bernard Holden". The Telegraph. London, UK. 4 October 2012. Retrieved 14 June 2014. ^ "Dame Vera Lynn to receive Burma Star". The Times (62091). 20 March 1985. p. 2, col. A. ^ "Vera Lynn". Retrieved 1 January 2011. ^ "Official Charts – Vera Lynn, Top 75 releases". Retrieved 10 January 2011. ^ "Recording: It Hurts to Say Goodbye". Retrieved 10 January 2011. ^ "This is your Life". Bigredbook.info. 1 January 1979. Retrieved 18 December 2012. ^ "Lynn [Welch], Dame Vera". Gove Music on Line. OUP. Retrieved 10 January 2011. ^ operathephantom (26 May 2011). "Dame Vera Lynn performs at 1990 Royal Variety Performance". YouTube. Retrieved 14 March 2019. ^ Bush, John; Eder, Bruce. "Biography (Vera Lynn)". Billboard.com. Retrieved 10 January 2011. ^ "We'll Meet Again – The Very Best Of". Acharts.us. Retrieved 10 January 2011. ^ "No. 44740". The London Gazette. 20 December 1968. pp. 10–12. ^ "No. 46593". The London Gazette (Supplement). 6 June 1975. p. 7376. ^ "HONORARY GRADUATES OF MEMORIAL UNIVERSITY OF NEWFOUNDLAND 1960– Present" (PDF). Memorial University of Newfoundland. Archived from the original (PDF) on 15 February 2016. Retrieved 15 March 2016. ^ "Lynn, Vera (1917—)". Encyclopedia.com. Retrieved 9 February 2016. ^ "Google Maps". Google Maps. Retrieved 9 February 2016. ^ "No. 61608". The London Gazette (Supplement). 11 June 2016. p. B27. ^ "Queen's Birthday Honours". The Daily Telegraph. Retrieved 10 June 2016. ^ "Locomotives at the NYMR". Nymr.co.uk. Retrieved 25 August 2016. ^ "Mid Sussex Times (January 14th 2019) Dame Vera Lynn portrait to hang on display at Royal Albert Hall". ^ "Vera Lyrics – The Wall Lyrics – Pink Floyd Lyrics". Retrieved 25 May 2016. ^ David Firth (28 May 2009). "Salad Fingers 7: Shore Leave". Youtube.com. Retrieved 23 September 2017. ^ "Vera Lynn". IMDb.com. Retrieved 23 September 2017. ^ "New Video for "Vera Lynn"". Anthony Green. Retrieved 14 March 2019. ^ "Vera Lynn is Cockney Rhyming Slang for Skin (cigarette paper)!". Cockneyrhymingslang.co.uk. Retrieved 14 March 2019. ^ "Stars Foundation for Cerebral Palsy". Starsorg.co.uk. Archived from the original on 4 July 2009. Retrieved 27 September 2010. ^ Lynn, Vera (1976). Vocal Refrain. Wyndham Publications Ltd. ISBN 0-352-39884-1. ^ "Breast Cancer Research Trust". Retrieved 23 October 2009. ^ "Dame Vera Lynn Trust for Children with Cerebral Palsy". Dvltrust.org.uk. Retrieved 23 October 2009. ^ "FLOW for ALL – Welcome". Flowforall.org. Retrieved 9 February 2016. ^ "THE DOVER WAR MEMORIAL PROJECT – Remembering the casualties of World War from Dover, Kent, England – the Front-Line town of Hellfire Corner". Doverwar,e,orialproject.org.uk. Retrieved 9 February 2016. ^ "Help for Forgotten Allies". Psrb.org.uk. 30 March 2013. Retrieved 26 August 2014. ^ Meredith, Charlotte (27 March 2013). "Dame Vera Lynn Backs Call To End 'Utterly Cruel' Pigeon Racing". The Daily Express. ^ Jenkins, Katherine (20 January 2008). "G.I. Jenkins: How the Welsh opera diva Katherine swapped designer dresses for desert camouflage". The Daily Mail. London, UK. Retrieved 4 January 2011. ^ "Blessed are The Times of My Life". Response Source. 17 September 2008. Retrieved 23 October 2009. ^ Thorpe, Vanessa (15 February 2009). "At 92, forces' sweetheart Vera Lynn tells her life story". The Guardian. London. Retrieved 23 October 2009. ^ "Dame Vera Lynn takes on BNP over White Cliffs of Dover". The Daily Telegraph. London. 18 February 2009. Retrieved 27 May 2010. ^ Singh, Anita (2 September 2009). "Dame Vera Lynn in chart battle with Arctic Monkeys". The Daily Telegraph. London, UK. Retrieved 2 January 2011. ^ "Dame Vera Lynn re-enters charts". BBC News. 31 August 2009. Retrieved 23 October 2009. ^ a b Leach, Ben (13 September 2009). "Dame Vera Lynn becomes oldest living artist to have number one album". The Daily Telegraph. London, UK. Retrieved 27 May 2010. ^ "Celebrities' open letter to Scotland – full text and list of signatories". Theguardian.com. 7 August 2014. Retrieved 26 August 2014. ^ Bletchly, Rachael (8 May 2015). "VE Day: Dame Vera Lynn on why we must always remember the heroes of the Second World War". The Daily Mirror. Retrieved 9 May 2015. ^ "Dame Vera Lynn breaks own record with new album at 100". BBC News. 2 February 2017. Retrieved 2 February 2017. ^ "Vera Lynn 100 by Vera Lynn". Amazon.co.uk. 1 February 2017. Retrieved 1 February 2017. ^ "Vera Lynn – Her Greatest From Abbey Road – Resident". Resident-music.com. 1 February 2017. Retrieved 1 February 2017. ^ "The nominations for the Classic BRIT Awards have been revealed". Classic FM. Retrieved 14 March 2019. ^ Farndale, Nigel (17 August 2009). "Dame Vera Lynn: the original Forces Sweetheart is still in demand". The Daily Telegraph. London, UK. Archived from the original on 26 November 2010. Retrieved 31 December 2010. ^ "Harry Lewis". The Herald. Retrieved 21 March 2015. ^ "Birthday chorus for Forces Sweetheart Dame Vera (From The Argus)". Theargus.co.uk. Retrieved 23 October 2009. ^ "British Crown Records – IAJRC Journal". Faqs.org. Retrieved 22 February 2011. ^ "Dame Vera Lynn With The 2nd Battalion, Grenadier Guards - Specially Recorded By Dame Vera Lynn For The News Of The World - Proceeds To The GulfTrust - News Of The World - UK". 45cat.com. Retrieved 21 March 2018. ^ "Vera Lynn – We'll Meet Again – The Very Best Of – Music Charts". Acharts.us. Retrieved 23 October 2009. ^ "Vera Lynn – We'll Meet Again (the Very Best of Vera Lynn) – Music Charts". Acharts.us. Archived from the original on 5 August 2012. Retrieved 23 October 2009. Wikimedia Commons has media related to Vera Lynn.